Roomba® 890 Wi-Fi® Connected Vacuuming RobotThe Roomba® 890 Vacuuming Robot loosens, lifts, and suctions dirt with up to 5x more air power. Dirt Detect™ sensors alert the Roomba robot vacuum to clean more thoroughly on concentrated areas of dirt. Ideal for homes with pets, the Roomba 890 features tangle-free brushes and a high-efficiency filter. Just press CLEAN or schedule Roomba on the go with the iRobot HOME App. ⚠ WARNING: This product can expose you to chemicals including Styrene, which is known to the State of California to cause cancer. For more information go to www.P65Warnings.ca.gov. The Roomba® 890 Vacuuming Robot loosens, lifts, and suctions dirt with up to 5x more air power. Dirt Detect™ sensors alert the Roomba robot vacuum to clean more thoroughly on concentrated areas of dirt. Ideal for homes with pets, the Roomba 890 features tangle-free brushes and a high-efficiency filter. 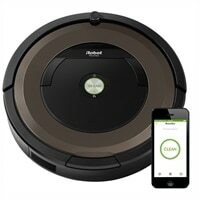 Just press CLEAN or schedule Roomba on the go with the iRobot HOME App.